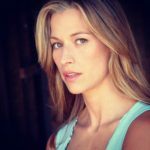 Brooke Langton is an American actress. She is best known for the role of Samantha Reilly in the Fox prime time soap opera, Mel rose Place from 1996 to 1998. Langton later had the leading role in the short-lived USA Network drama series, The Net (1998–99), and was the female lead in the 2000 comedy film The Replacements. "I compare it to being in a car accident. There’s so much adrenaline rushing through you that you remember being in the accident but you don’t remember any of the details."